Early last year I totally revamped the Tennant Coats I had been making by changing pretty much all of the materials I was using. 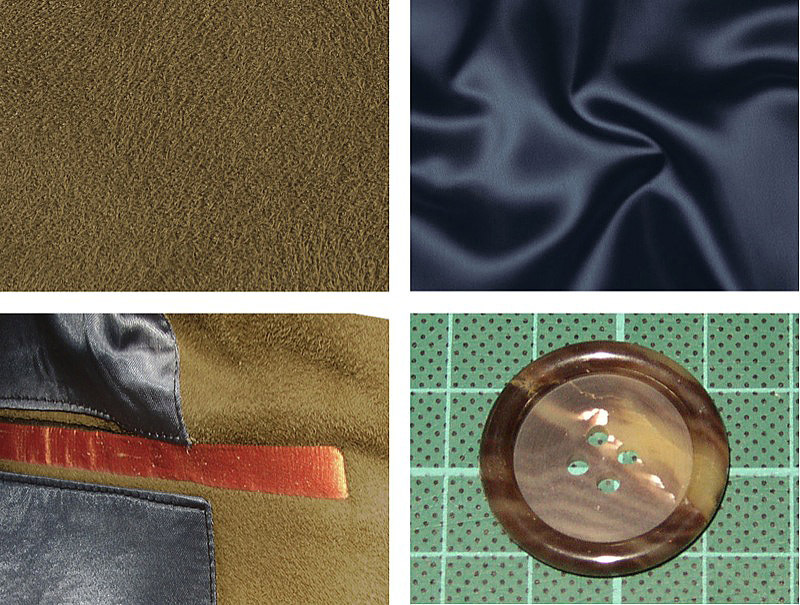 Originally I was using Malabar in walnut (see below, top left); a plain navy blue satin lining (see below, top right); a standard orange silk for the pocket welts (see below, bottom left); and a run of the mill one inch faux horn button (see below, bottom right). The revisions I made were to improve the colour of Malabar I used to Teak, which is much more screen accurate (see below, top left); I sourced a self-striped navy lining (see below, top right); found the exact orange silk that had been used for the real coats (see below, bottom left); and discovered a supplier for more accurate buttons in the right size and design (see below, bottom right). But as ever I am always striving to get things better, and I recently had a bit of a unexpected push which has improved things even further. 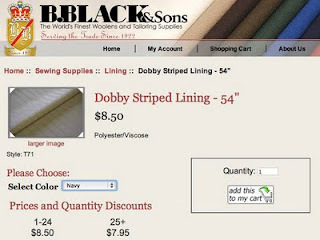 The self-striped lining I had been using came from B Blacks in Los Angeles. They imported it from Italy, so although it went round the houses a bit, it was by far the closest available. The price was pretty keen, but with shipping and import duties made it no more or less expensive than the plain lining I had been using, so it was worth the effort of ordering. Anyway, earlier this year I was running low so placed another large order, only to me told the fabric had been discontinued and would never be restocked. I was gutted! 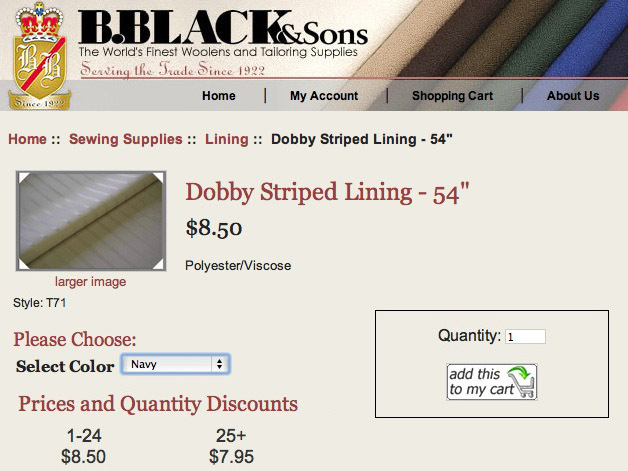 There was no way I could now go back to a plain lining now, so I look around for an alternative supplier. Nothing was looking remotely similar or suitable, so I decided that drastic action was needed: the only thing I could do was get the fabric rewoven! And since I was going to take it that far, I may as well get the fabric spot on and match the SCREEN-USED lining as close as I could get it. To cut a long story short I found a mill in China who were willing to handle the job, and do me a short run quantity, which made the exercise financially viable. After many weeks of emailing back and forth, exchanging information and negotiating the price and terms the weaving started last month. It took a few weeks for the job to be completed and the fabric to by dyed to the correct shade, and after traversing customs the roll of fabric finally arrived this week (see right). And it has come out FANTASTIC! Here is a nice photo, showing off how it has turned out. 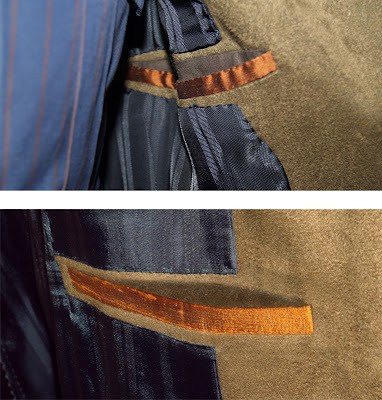 Finally I thought I’d do a side-by-side comparison between a shot I took of an original coat at the Earl’s Court exhibition, and a coat I am currently working on. Looking good! fabulous! 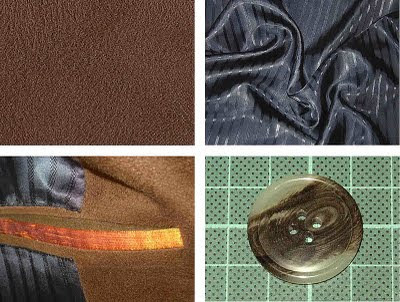 I might have to bug you about factories at some point, I'm always wanting weird fabrics for non-doctor who things. That's cool that you were able to get exactly what you wanted! Aha, we finally get to see the new lining! Looks awesome. I love how you always seem to hit the roof with accuracy, have everyone satisfied with what you have chosen, then somehow still managed to break down that roof and build it much higher with even better stuff! You go above and beyond with these projects and it always shows! That is fantastic! 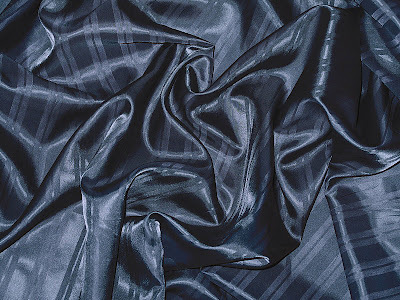 I have always been curious about what it would be like to deal with mills to create fabrics, especially since there are many types of fabrics that Spoonflower can't produce. Where did you get the buttons from Pumpkiny? You sir have labored to produce! Absolutely fantastic. 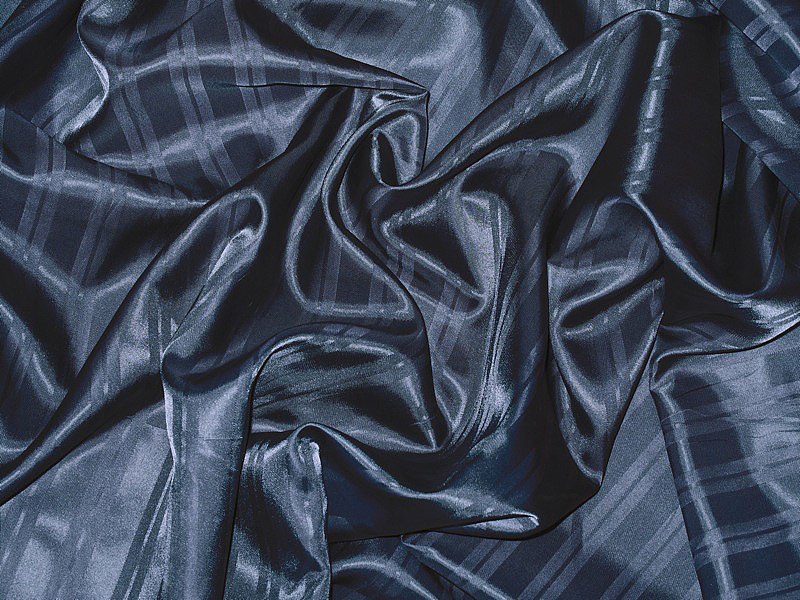 Will you be willing to sell some of the lining material, or are you saving for the ones you make?